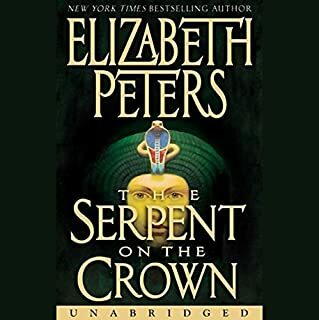 There is little I can say about this book that I have not already said repeatedly about Books 1-5 of this series. 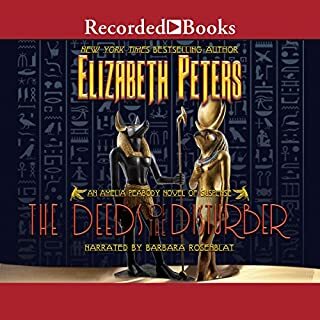 The stories of Elizabeth Peters and the narration of Barbara Rosenblat are the perfect combination for wonderful audible listening. Peters writes the Peabody series with dry wit and humor, and Rosenblat delivers that wit and humor precisely as intended by the author. 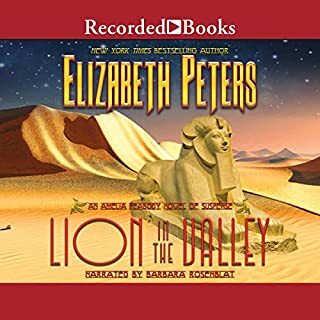 This book involves the Emerson family in traveling across the desert to find "the Lost City" and rescue a young girl from the ancient culture of the City and take her back to civilization. 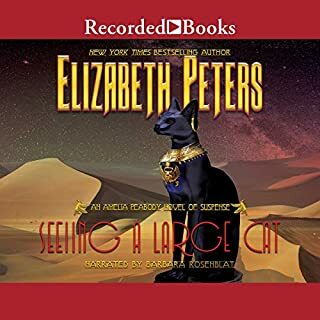 In a nod to the novels of H. Ryder Haggard, Peters has stuffed this story with great adventure and derring-do, and Rosenblat makes it all exciting while being humorous. As with the rest of the series, there are many LOL moments. 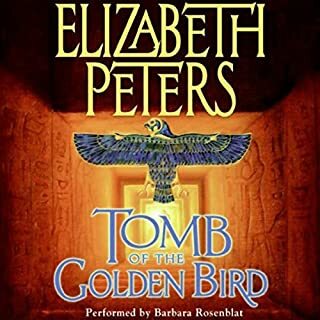 And I am always amazed at the talent of Barbara Rosenblat, who delivers British, American (from the South),Scots, Egyptian, French, German and other assorted Arabic accents and voices, with a voice of a timbre which allows her to make adult males, females, and children all believable. This is one of my favorites in a great series. 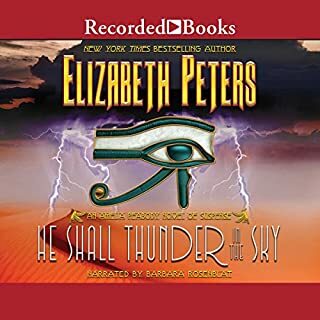 It has the signature humor, fine characterization, and action that make every Amelia Peabody worth listening to. 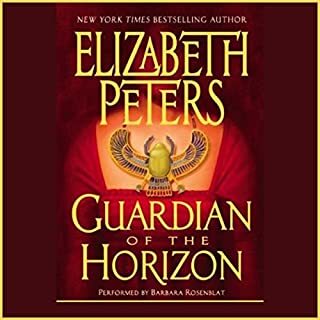 I've read them all, but Barbara Rosenblat's narration really makes these books soar. An important new character is added in this one, so don't miss it! 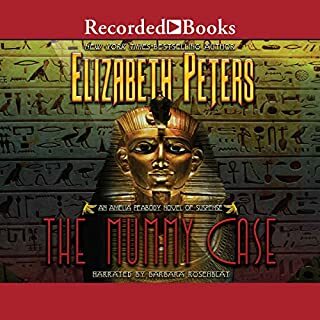 Amelia Peabody series is great! 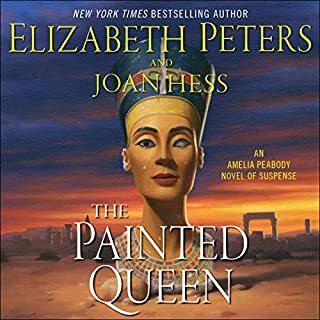 Elizabeth Peter's Amelia Peabody, along with her husband - Emerson, is an archaelogist and expert on Egyptian pyramids. Each year they spend time working on digs but danger, murder and young lovers "dog" each season. 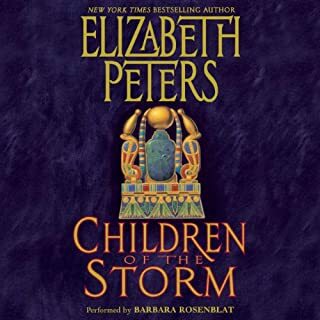 This book in the series is by far the most superb with masterful development of the characters, plot and sub-plots. The tension before all is resolved will please any mystery reader, particularly those that enjoy historical fiction. 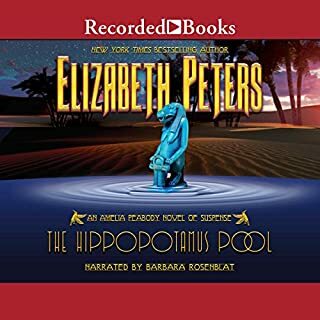 Barbara Rosenblat's narration is here! 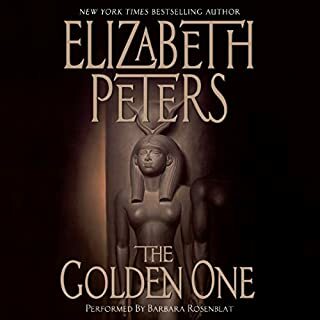 I missed this book when I was on my Elizabeth Peters wave, because of the change in narrators. Then today I was browsing for similar books and saw this! 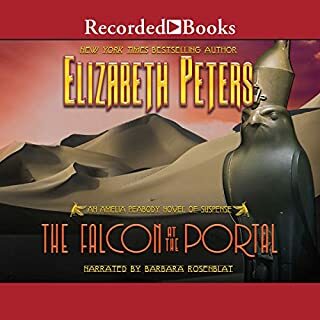 Now that Barbara Rosenblat's narration is available, I bought it right away. Amelia Peabody books are such a pleasure when read by Barbara. The books are great on their own, but this narrator was made for them and enhances the experience exponentially. They are so uplifting when read by Barbara Rosenblat. And they are worth every cent - I have re-read each of them 2 or 3 times. 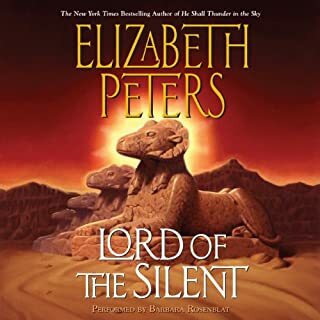 Thank you Audible for making this available! Yay! 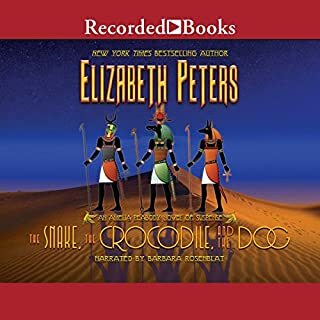 Elizabeth Peters continues the Amelia Peabody series with disputably the best book since Crocodile on the Sandbank. Set in the Sudan, the book has the usual number of twists and dastardly villains. We are provided a small glimpse of a very loquacious Ramses as he approaches adolescence. I do like how Peters continues to develop the relationship between her characters as they grow together and age. 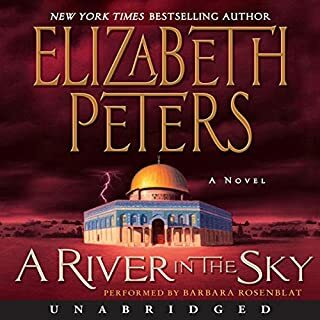 Barbara Rosenblat’s narration is, as ever, simply amazing. This is the best Amelia story yet. The plot twists and turns as much as the path Amelia and Emerson take. The reader can't tell who they should trust! Barbara is truly gifted. She advances this moderately interesting plot to the level of a delightfully engaging tale. 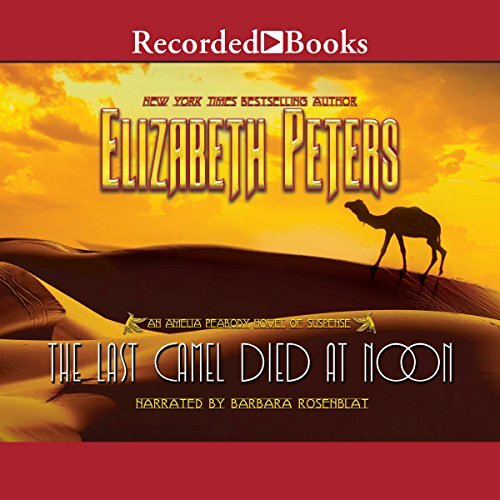 Would you consider the audio edition of The Last Camel Died at Noon to be better than the print version? Absolutely! The superb narration brings the characters to life in a way the written word does not. Barbara Rosenblat could read the phone book and make it interesting! I did not see this as a bite-your-nails thriller but there several escape by the seat of your pants scenes in the book. I did not have a favorite scene in this story. The Amelia Peabody series is not meant to pull heartstrings but to amuse and entertain. 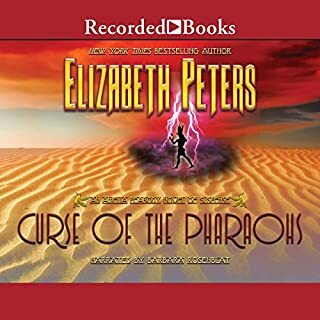 Trapped in a lost civilization, Amelia Peabody, her husband Emerson, and her son Ramses solve a mystery while trying to escape. Precocious Ramses leads the villains on a frustrating chase. Thought the story was weak. While the performance surprised me at times I just couldn't get into this book at all. The attempts at humor were lost on me. Most stupid book I've ever listed to. 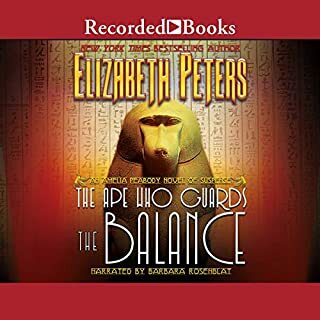 I bought it primarily because I like the narrator, Barbara Rosenblat. But she made the characters sound shallow. I kept going because I thought it would get better. It didn't. Glad I didn't pay full price!! !